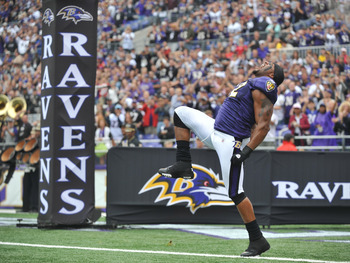 No matter how old Ray Lewis is he'll still scare and intimidate any NFL player. You counted your candy and you took off your costume as Halloween is now officially over until next year, but what if I were to tell you that five NFL players rather it’s Halloween or not will still scare the socks right off of you. So without any introduction, here are the five scariest players in the NFL right now. 5. Tom Brady- Six time Pro Bowler, three time Super Bowl Champion, and two time M.V.P. Tom Brady is by far one of the most feared quarterbacks in the game. Not only is his presence of what he’s capable of doing scary enough but his emotion and horrific glare that he shows to the opposing team as it seems as if nothing can stop him or intimidate him in any way makes him clearly one of the most feared players to play against when his team shows up on the schedule. 4. Darrelle Revis- If it’s not scary enough for you that Darralle Revis has his own “island” as people call it because when he plays against opposing wide receivers he takes them completely out of the game, isn’t scary enough for you then I don’t know what is. Andre Johnson, Terrell Owens, Chad Ochocinco, Reggie Wayne, Vincent Jackson, Randy Moss, Steve Smith, Roddy White, Marques Closton, all just few of the players that Revis has shutdown in his career and has made them almost invisible when they went up against him. He’s the best and he shows no signs of letting up as each game ends in the same story and the same result of teams not throwing the ball to his side as they fear that he’ll intercept it, swat it down, or even worse return it for a touchdown. 3.Calvin Johnson- Nicknamed “Megatron” from the character from Transformers due to his rare combination of size, hands, speed, strength, leaping ability, body control and hand–eye coordination Calvin Johnson is hands down the best wide receiver in the NFL. Currently third in receiving yards at 804 behind Carolina Steve Smith (918) and New England Wes Welker (824) and leading every receiver and running back in touchdowns with 11, Calvin Johnson is proving to everybody and everyone that he’s clearly the leagues best. Rather it’s a streak route, zig zag, double team, triple team, or a jump ball, just throw the ball in his area and chances are number 81, Calvin Johnon is coming down with it. 2. Ndamukong Suh- Ndamukong Suh makes quarterbacks, running backs, and offensive lineman cringe in fear when they see him lined up against them. They cringe in fear because not only will he just get by you or tackle you but he may even hurt you and the best part about it, is that he doesn’t care…not one bit. With complaint after complaint and comment after comment from all various players that Suh plays to hard and that he hurts players on purpose says it right there alone, that he’s a scary player. But when a player says and thinks that he’s not even human, that’s even scarier; “I’m just a different breed. I hate to say that, but it’s kind of like, no athlete in the NFL is like any other person. You can’t treat everybody the same exact way,” Suh told ESPN. 1. Ray Lewis- Ray Lewis lives, breathes, and eats football. It’s everything to him and his 12 time Pro Bowl appearances, two time defensive player of the year awards, and his Super Bowl ring shows that. Though he doesn’t care about all of those luxuries as he only cares about one thing; winning and he’ll do anything to get it even if that involves tackling his own mother to win it will happen and he doesn’t care about what you think, the opposing team thinks, or I what I think. He’ll hit you, he’ll abuse you, he’ll make you cry, and he’ll scare you. From the pre-game dance, to the leader in the huddle, to the rest of the yelling and screaming, Ray Lewis even at age 36 is still the most feared player in the NFL. 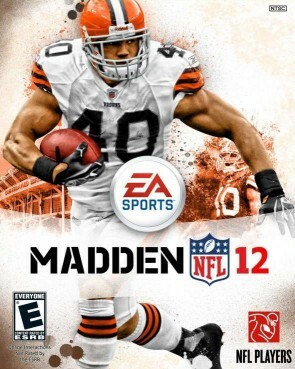 Will The Madden Curse Strike Again This Year? What will it be this year? Or will it be nothing? The Madden Curse usually consists of an injury which may last a few games and then go away or may turn into a season ending injury. However sometimes it doesn’t end there as that injury may turn into another injury the next season or maybe even a career ending injury. Though last years cover boy Drew Brees, quarterback of the New Orleans Saints survived the Madden Curse but still managed to get injured. Though it wasn’t as severe, Brees played with a low grade MCL sprain for most of the season. Does that mean that the curse that petrifies players and ruins team’s seasons is finally over? Or was the curse just taking a break? Who knows? In the meantime let’s have a quick history lesson. 2011, Drew Brees: Brees played in every single game, however played with a low grade MCL sprain, then they were upset by the Seattle Seahawks in the playoffs. 2010, Troy Polamalu/Larry Fitzgerald: Polamalu only played five games due to reoccurring knee injuries, Steelers go 9-7 and just miss the playoffs. As for Fitzgerald, he wasn’t affected much, 97 receptions, 1,092 yards, 13 TD, and made the Pro Bowl. 2009, Brett Favre: Comes out of retirement, fights with the Packers management, then traded to the Jets, starts off hot but then goes horrible down the stretch as the Jets lost 4 of last 5 games. 2008, Vince Young: Missed 1 game with quad injury; led the Titans to their first playoff appearance in four years. 2007, Shaun Alexander: Fractures his foot then goes onto miss six games; less yards and Touchdowns in 2006 and 2007 then what he had the previous seasons in 2004 and 2005. 2006, Donovan McNabb: Gets a sports hernia in the first game of the season, goes onto miss seven games; fights with Terrell Owens all year long; then after making it to five straight pro bowls, McNabb not only misses it that year, but hasn’t been to one since. 2005, Ray Lewis: Breaks his wrist, however only misses one game; has his first season without an interception; misses 10 games next year with thigh injury. 2004, Michael Vick: Fractured his fibula one day after Madden was released, he would miss 11 games; Pro Bowl next 2 seasons; then had off the field issues and was sent to jail. 2003, Marshall Faulk: Hurts his ankle and misses two games, and never rushed for 1,000 yards again. 2002, Daunte Culpepper: 4-7 record to start the season then injures his knee ending his season. 2001, Eddie George: Has a career season, but then in the playoffs he fumbles as top-seeded Titans lost in the first round to the Ravens. 2000, Barry Sanders: Retired one week before training camp. So what will the curse be this year? A bad season for the Cleveland Browns? (Not like they haven’t had that happen before). An injury? Could happen, but how long would it last? How serious would it be? All questions, that will eventually be answered whenever wherever by the glorious, famous, Madden Curse.